"Yowzers! 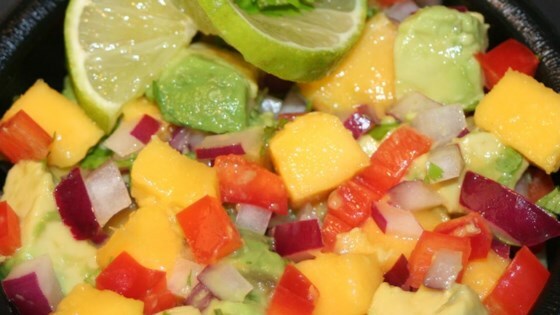 Sweet and hot salsa with tangy mangoes and habaneros. Great with pork, chicken or fish or just with chips. You can omit the habaneros and add red bell peppers for a non-spicy version, but then again, why would you want to? Remember, ALWAYS wear gloves when working with habaneros!" Place the avocado in a serving bowl, and mix with the lime juice. Mix in the mango, onion, habanero pepper, cilantro and salt. 1 lime is too much lime juice, but it was tasty despite. I used serrano peppers instead of habaneros because I wasn't sure I could handle the habaneros, but the serranos weren't bad either. We left out the hot peppers and it was a wonderful side dish! I used red and green bell peppers and it was excellent! YUM!! I may even venture out and include a little jalapeno or habaneros peppers next time. Everyone enjoyed this recipe. I put it on cheese burgers and my husband LOVED it.